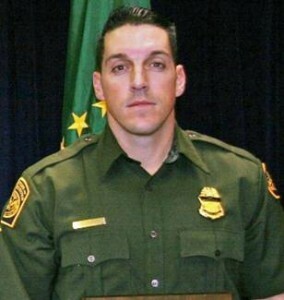 Two men convicted of murdering Border Patrol Agent Brian Terry were sentenced to life in prison Wednesday, ABC News reports. Terry’s death revealed the bungled gun-running operation known as Fast and Furious when weapons purchased during the probe ended up at the scene of the shooting that left him dead. Jesus Leonel Sanchez-Meza, Ivan Soto-Barraza and three others planned to rob marijuana smugglers in southern Arizona when a shootout occurred, killing Terry. “They knew someone could or would get hurt, but that did not stop them because their greed was much more powerful than having a conscience,” Terry’s sister, Kelly Willis, said. Two members of the robbery crew are still fugitives, and another pleaded guilty to murder. “Obviously, he’s very remorseful,” defense attorney Ramiro Flores said of Sanchez-Meza. Posted: 12/10/15 at 9:16 AM under News Story.